Over 7,000 companies in over 100 countries use the company's Enterprise Mobility Management (EMM) solution to deploy mobile apps on various devices. Based in Bangalore, 42Gears is establishing a base in Manchester to utilise the local talent pool and business community as it looks to expand. The new office is located at 4 Piccadilly House in the city centre. The move comes after 42Gears won the Tech Fast50, organized by Deloitte Touche Tohmatsu India LLP (DTTILL), and was also one of two companies to win the associated ‘Manchester Prize’, coordinated by MIDAS, Manchester’s inward investment agency. 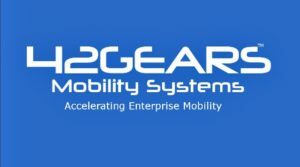 Kaushik Sindhu, associate vice president of 42Gears Mobility Solutions, said: “Manchester is a world-class city with a thriving tech community and a booming economy, and the ideal location to act as a launch pad for 42Gears to connect with European partners and customers. The company will look to expand in two hiring phases, focusing first on sales and service consultants for UK operations, and then on European operations. Tim Newns, chief executive of MIDAS said: “It’s a pleasure to welcome 42Gears to the city, another in a trend of companies choosing Manchester as a base for their European expansion.